Marsh harrier, male, on the "run" - right on to my hide. He and his partner are being chased away from the breeding area of the smaller, but more dominant, Montagu´s harrier. Hilarious to watch how they try to "sneak back in" to breed unnoticed from the sharp eyes of the graceful Montagu´s. 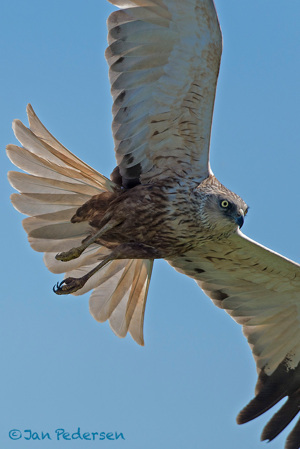 (Marsh harrier = brun kärrhök = rørhög, Montagu´s harrier = ängshök = hedehøg).